This spot is famous for the towering water splash that can be higher than the coconut tree! Known well as one of the considered place for prewedding photosession, Water Blow has its own charm, although the visitor may have to wait for the big splashes. 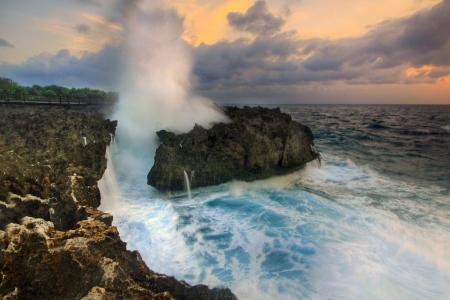 Water blow is located in Nusa Dua, just another 45 minutes by car from the airport. It's easy to reach and absolutely free. You don't have to pay to enjoy the beautiful scenery of the splashing wave soaring to the sky. 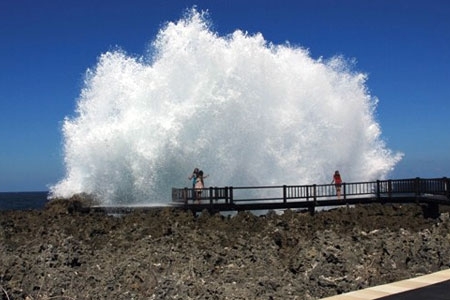 The secret behind the big water splashes is the coral reefs that naturally formed in such way combined with big waves that come into a narrow opening. When the big wave passing through the opening and hit the reef, it will blow upside and create a beautiful sight. There is an observation deck nearby at the end of the pedestrian pathway. If you're into more challenge, you can explore the coral reefs and get closer to the wave. You must wear a proper footwear and be extra cautious though, because the reefs are sharp and slippery. Beware, don't get too close to the edge of the reef! It's very dangerous. To get a good picture of the towering wave, you have to wait a little for the big waves. You also have to consider the spot and angle, because there are people surrounding you. Another interesting thing about this place is the location which is in the area of BDTC (Bali Tourism Development Corporation), Nusa Dua. There are a lot of restaurants, hotels/villas and resorts nearby, with cozy atmosphere with less crowd than Seminyak. The area is well arranged with very nice garden alongside the main road. If you're into this coziness and peaceful area, you have to consider spending time here and visit waterblow near sunset time.